Berlin, 20.12.2018 – Once again business partners of CROWDCONSULTANTS will be surprised with a special New Year’s greeting. 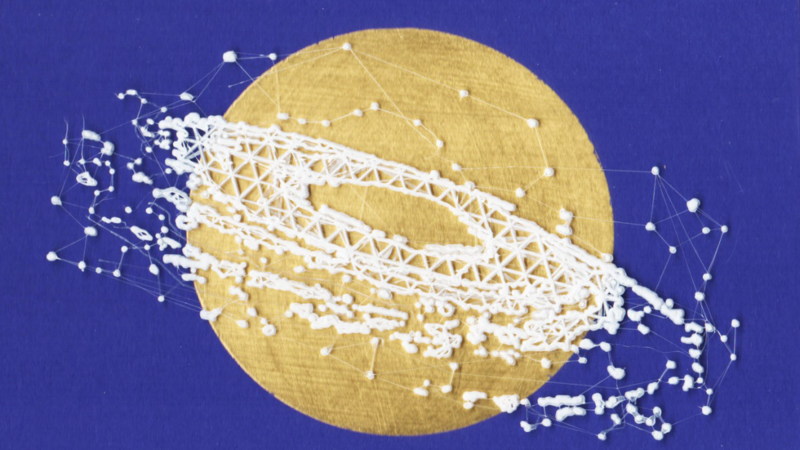 The digital pioneer Emil Schult designed a multiple whose motif refers to one of the world’s most famous Big Data Use Cases, the high-precision 3D mapping of our galaxy by the Gaia probe of the European Space Agency. After the great success with the project “I am digital, 2017”, the multimedia artist and digital pioneer Emil Schult once again designed the New Year’s greeting for business partners of CROWDCONSULTANTS. 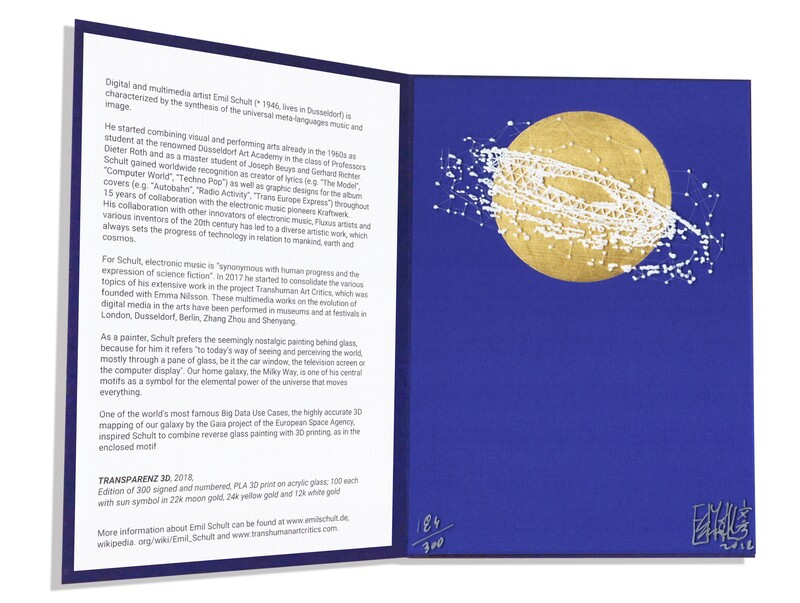 Schult designed an acrylic reverse glass painting with 3D print of the galaxy and sun symbol in an edition of 100 copies each in 22 k yellow, moon and white gold. Schult describes his work “TRANSPARENCY 3D, 2018” as a “symbol for the connection of the almighty primordial power of the universe with the seemingly infinite opportunities and challenges of digitization, as currently addressed by the Gaia project”. Gaia is a space probe of the European Space Agency (ESA) that carries out a highly accurate three-dimensional optical survey of the entire sky. Although the probe ultimately captures “only” one percent of the stars of our Milky Way astrometrically, photometrically and spectroscopically, the mission is one of the world’s largest digitisation and big data projects. CROWDCONSULTANTS 360 GmbH was founded in summer 2016 in Berlin by digital natives Damiano Albrecht and Stefan Heidloff as well as the former top executives Torsten Ecke and Peter Bachsleitner as an expert network for digital transformations and new work methods. They see themselves as cross-industry and cross-functional management and personnel consultants who consistently focus on digitization, principles of the sharing economy and cross-generational teams. Thus, the enterprise scores particularly with professionals seeking for new-work-environments and has already convinced several start-ups and in engagements for renown enterprises such as AUDI, ING bank, Knauf as well as the European Space Agency. CROWDCONSULTANTS have won numerous awards, including Start-up of the Year at the International Business Awards 2018 and Grand Stevie® as Company of the Year 2018 in Germany. The digital pioneer and multimedia artist Emil Schult (born 1946 in Dessau, lives in Düsseldorf) was a master student of Joseph Beuys and Gerhard Richter at the Düsseldorf Art Academy. Even then, in the 1960s, he combined visual and performing arts. He became known worldwide through more than 15 years of cooperation with the electropop pioneers Kraftwerk, especially through his co-authorship of songs such as “Das Model”, “Computerwelt” and “Technopop” as well as the design of record covers such as “Autobahn”, “TransEuropeExpress” and “Radioaktivität”. To this day, Schult’s work with pioneers of electronic music, Fluxus artists and inventors of the 20th century has led to a diverse artistic oeuvre. The central theme is always the progress of technology in relation to man and the cosmos. Since 2017, Schult has brought together the various themes of his extensive work in the Transhuman Art Critics project (www.transhumanartcritics.com) founded with Emma Nilsson. His multimedia works on the evolution of digital media in art have so far been performed in museums and at festivals in London, Düsseldorf, Berlin, Zhang Zhou and Shenyang.